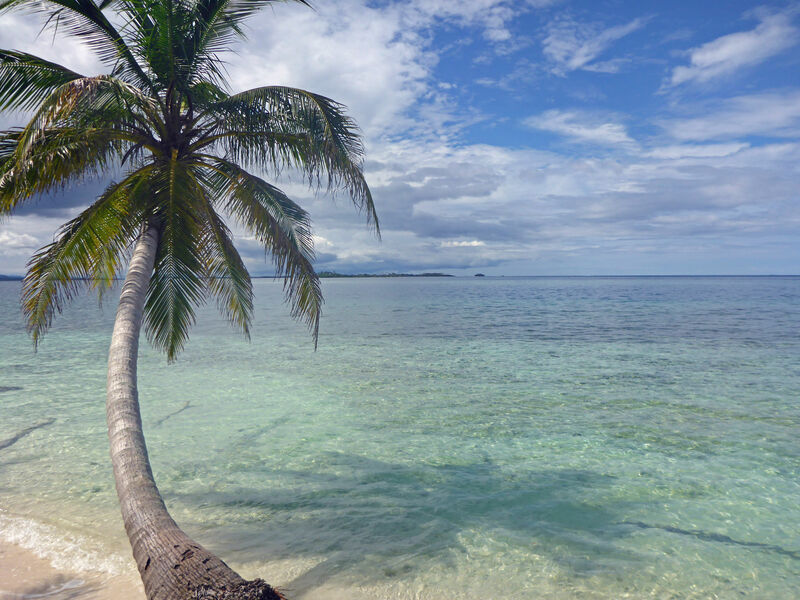 The San Blas archipelago is one of the top cruising destinations in the Caribbean. 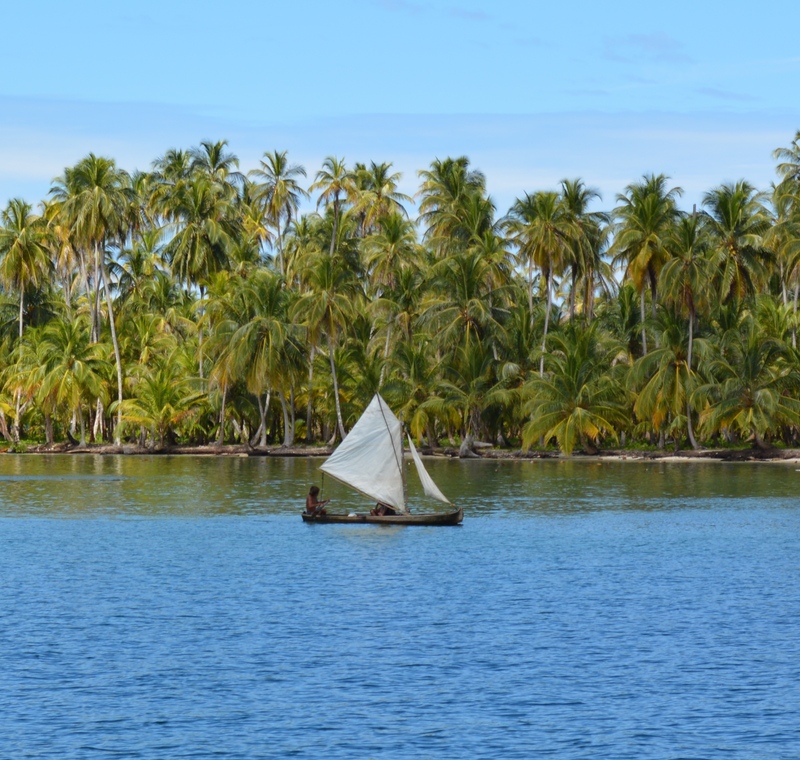 Lying only 70 miles east of the entrance to the Panama Canal, these 300+ islands range in size from a spit of sand with 1 perfectly arching palm tree seen by many only in beer ads to village islands with dwellings packing ever inch. Of the 300+ islands, only 30 or so are inhabited, Nargana is one of them. But mainly you see uninhabited islands surrounded by the clear Caribbean sea. They lie off the Panama mainland which is mostly undeveloped. 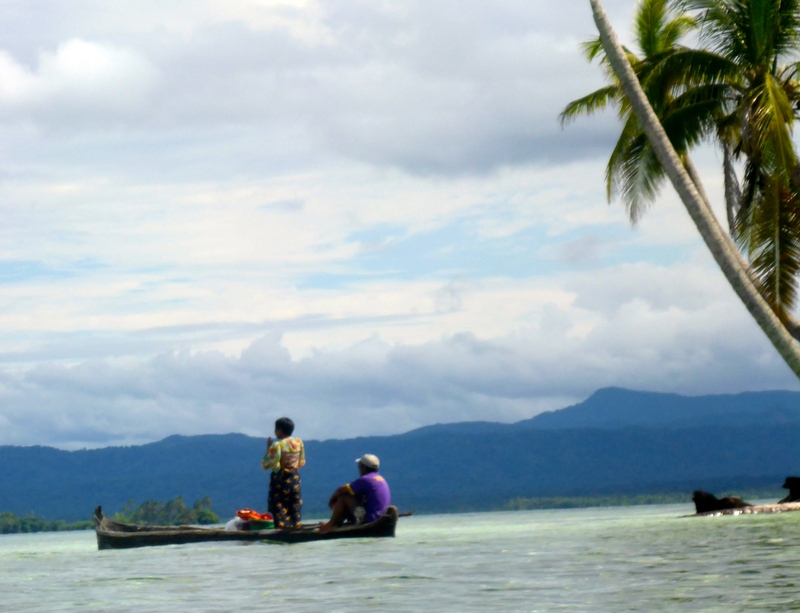 Travel, other than by boat, into Guna Yala is an arduous dirt road jeep trip + water taxi or by small plane. How is that for airport parking? 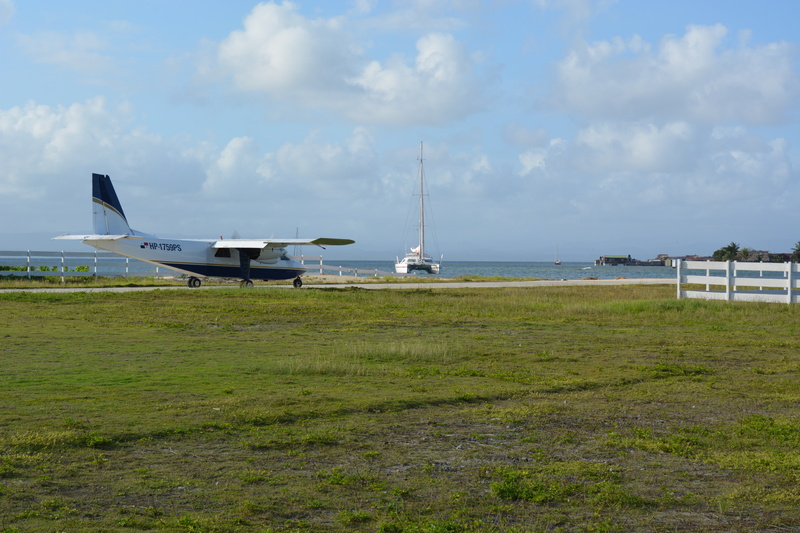 Neko anchored at the end of the runway. The Gunas are the indigenous folks who live in the islands and are proud of their traditional way of life and, though technically Panamanian, they have managed to live autonomously and preserve much of their culture. Hard to see but this Guna lady is standing in her boat talking on her cell phone. Hey, I didn’t say they were Amish, a gal has gotta keep in touch. Many times Guna will come by your boat asking you to charge their phones as most islands have no electricity. 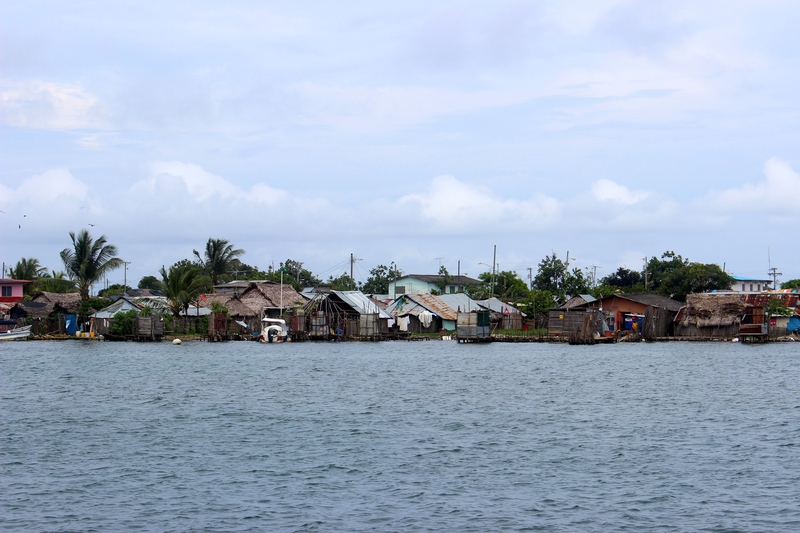 The Gunas are the primary residents of these islands and have their own language and refer to the area as Guna Yala (Panamanians call it the San Blas). Charts of the area label the islands with a bunch of hard-to-pronounce letters each ending in “dup” (pronounced doop), the Guna word for island. Doesn’t “Ogoppiriadup” just roll off the tongue? Guna sail or paddle their cayucos all around these islands. However, having once been a part of Colombia and now Panama, Spanish words pepper the area as well. And now that the Americans, Europeans and gringos in all shapes and forms have discovered this cruiser’s paradise, they have added names of their own. So the anchorages around Banedup, Quinquindup, Kalugirdup, Miriadup, Tiadup are referenced by clear-water loving cruisers as the ” the swimming pool” “the hot tub” and “the changing room”. You can see why they call it the swimming pool. Mike and Dave night swimming. And if you look to the left of Mike you can see our anchor chain…now that is some clear water! In addition, there is a Dog Island, a Green Island and BBQ Island. The Gunas are small-statured people, with large skills in fishing and mola making. Molas are multilayered panels of cloth cut away to achieve intricate patterns of abstract shapes or animals. Aappliqué is also used and carefully hand stitched to create the panels. 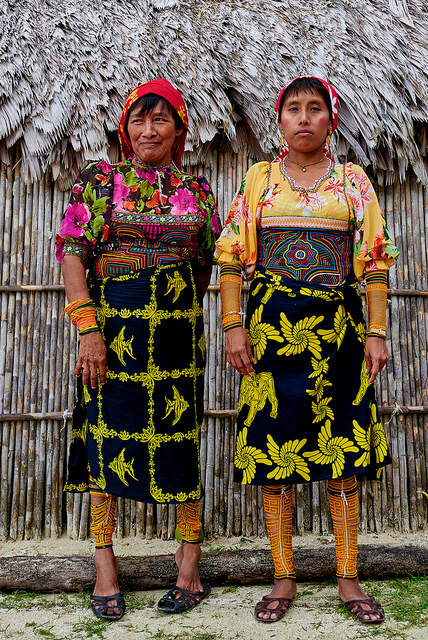 Guna women in traditional dress. 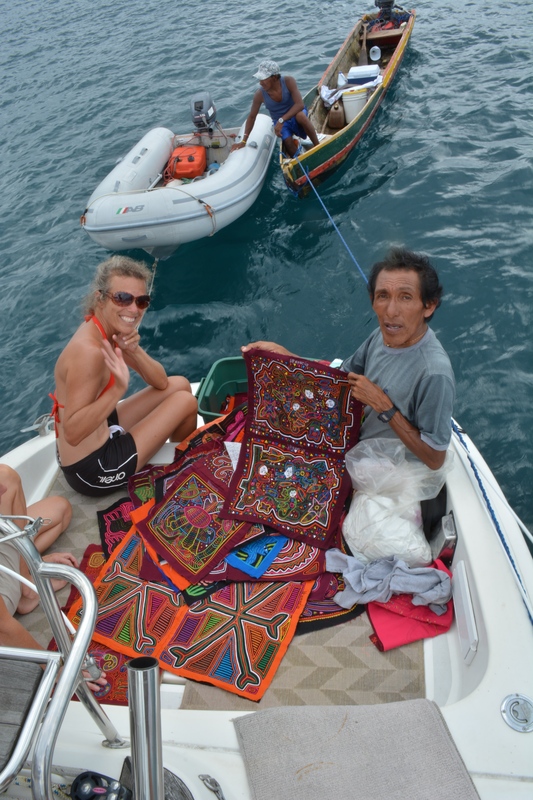 I got this photo online to illustrate the mola panels on the front of their shirts. And intricate wini bead design around their legs. The molas are used as a front and back panel of women’s blouses, but the craft has become their signature and the panels are seen now by many as folk art. 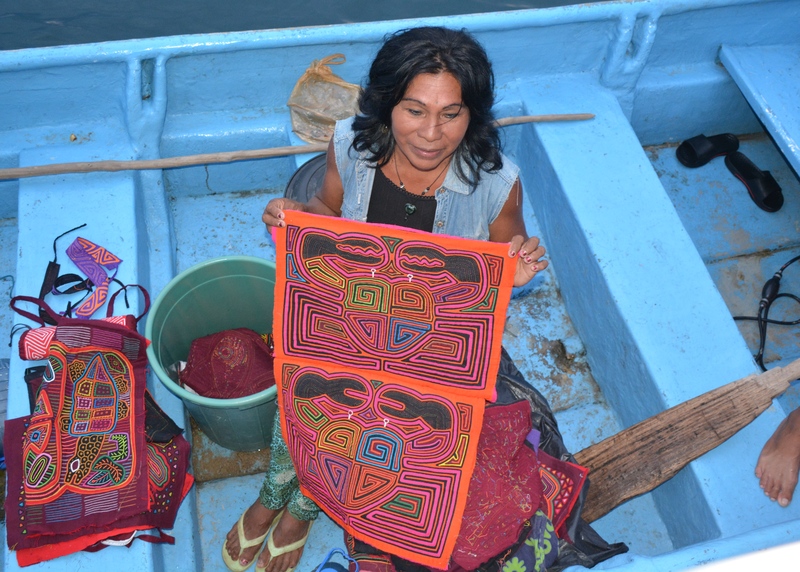 While fishing, lobstering and crabbing are traditionally done by the Guna men, mola making is “women’s work”. However, the two master, and best known, mola makers are transgender men (completely normal and accepted by the Guna), the famous and talented Lisa and Venancio. Lisa, master mola maker comes by for a visit. 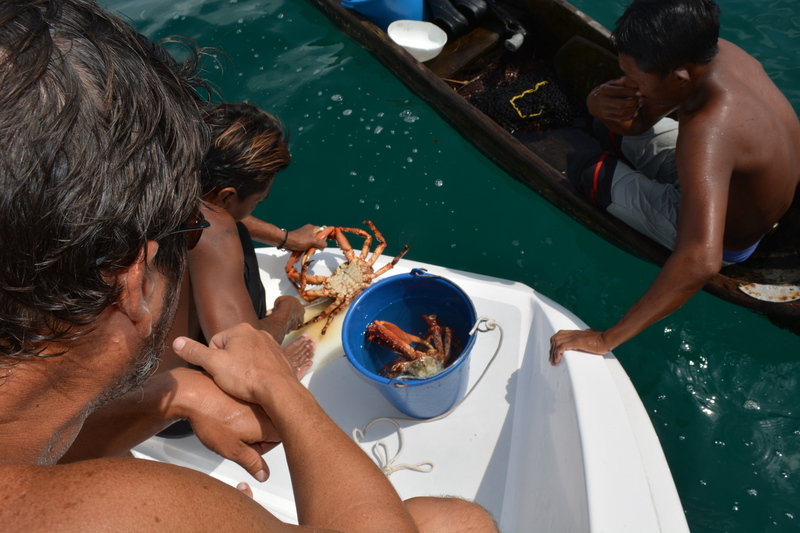 We dined several times on local lobster and giant red crabs sold to us by enterprising Guna fisherman working from their dugout canoes. We had the pleasure of our friends Mike and Holly joining us on Neko for a few weeks of sailing these beautiful islands. Fellow boat pals Rob & Rose on “R&R Kedger”, Dave & Melissa on “Apsaras”, Dave & Margaret on “Heart and Soul” and special guest stars Roger & Susan on “Second Wind” made up our fun loving “lobster” fleet. By the way readers, the SS Neko is now open for visitors, so let us know if you want to spend some time with us. Peter, Mike and Dave aka the lobster executioners. Mary and Holly ready to steam these babies. Next up, giant red crabs for dinner. This time kindly fishermen did the dirty work of cleaning them. Thanks to R&R, Apsaras and Second Wind for sharing photos. Click on photos to enlarge. Veggie, Fruit and Beer vendor. Always a happy sight. For some reason, Lucy never looks at the camera. Yes, when there aren’t garbage cans you have to burn your trash. A horse’s skull in the Guna Yala? My Guna friend Adelaida showing me how to wrap wini beads. Who says we don’t work? Peter and Mike patching the kite. This entry was posted in 2nd Season, islands, Panama, Sailing by Mary. Bookmark the permalink. You will have Christmas in Paradise this year! Looks absolutely beautiful ! Have a great holiday. Have I mentioned how much I love these posts?? Merry Christmas!! Melissa and Eric are coming for Christmas Eve. Matt arrived yesterday. I am having an all fish night. – crab cakes, lobersters from Maine, mussels, shrimp, and of course Syrian food. Melissa will have Christmas Day. We all love Melissa’s snacks so I think she will have a variety of knoshes. We all love you and enjoy seeing you in our e-mails. Send a little sun and warmth this way. I see you basking in the sun and swimming in crystal clear waters. What a tough life! Uncle Tom retired and has recently rented a house in Laguna Beach. I will be going there for a week in February. Then on to Plano to see the Bahash’s. And maybe hopefully to Jamaica for a special celebration. Miss you and hope to see you in 2015. Love to all, and give Lucy a rub for me. Nice post Mary. Let’s do it again! Willy is ready to come down there and make up for lost time with his gal Lucy!! Finally arrived in a place w/ enough wifi juice to download and view this. Beautiful job – I am so jealous! Wish we were there w/you…well maybe in a couple of weeks or so! Once the wedding is done on NewYears…we are kinda free for awhile…:keep the posts coming-how is the sailing between the islands? Lots of wind? Love to you and Peter and Lucy! Hey…leave some lobsters for us. We’ll be there soon.